Good morning! 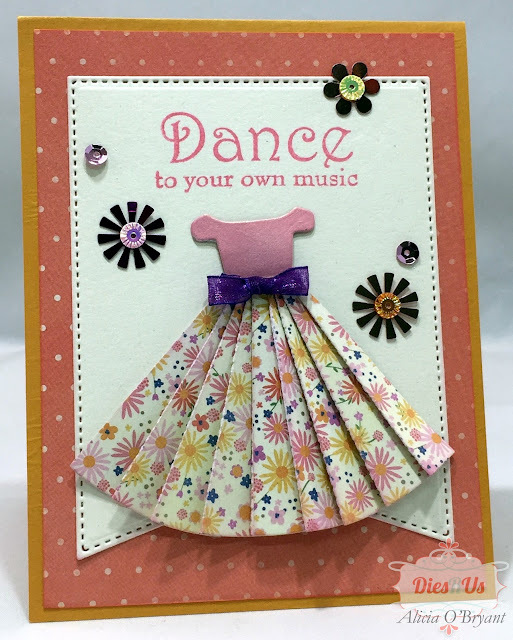 Alicia blogging today with a feminine card using the Frantic Stamper Pleated Dress die. Since I have four nieces I am sure this die will come in handy. I envision sweet little dresses and formal prom dress for cards and perhaps party invites. For today, I went with a sweet little floral dress but I can see the possibilities are endless! As always with a new die, I cut it out in plain white paper and played around a bit. I found I liked when I used two cuts of "pleats" for the bottom of the dress. First I used an accordion fold on the "pleats" with the help of a bone folder to really make them crease. To adhere my two pieces of "pleats" I simply used a strip of tape runner along the inside edge of the top piece. When adhering my bottom to the card I used plenty of tape to keep the pleats in place. There are three choices for "tops". I like this one for this dress, it was a little less formal. Finally, I tied a bow from some ribbon and adhered to the waist with glue dots. I finished off the card with some sequins, another die cut layer and matching papers. 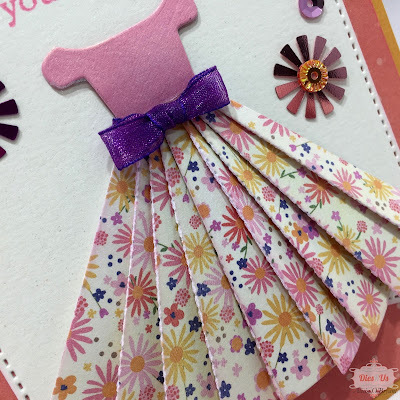 Adorable dress die and sweet card! What a darling little dress! Yes, I can see this being used for many occasions as well. What a wonderful inspiration! Oh Alicia this is absolutely adorable! What a fabulous idea and you did an amazing job! Thanks for awesome inspiration! Well done! What a fun card. Takes me back to when I played with paper dress dolls. Am I showing my age? Love your choice of patterned paper! It reminds me of paper dolls, too! Only I can determine the material for the dresses so a little paper doll and a little dress designer! I love it!